A couple of months ago, Deas and I took our very first trip in the RV. 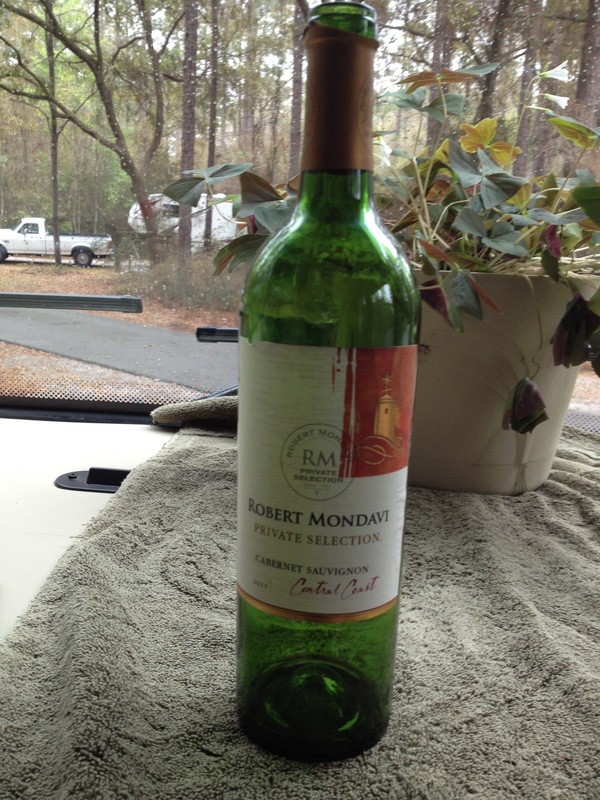 We were headed to Red Bay, AL (where our Tiffin RV was manufactured) but we were going to take several days to get there. 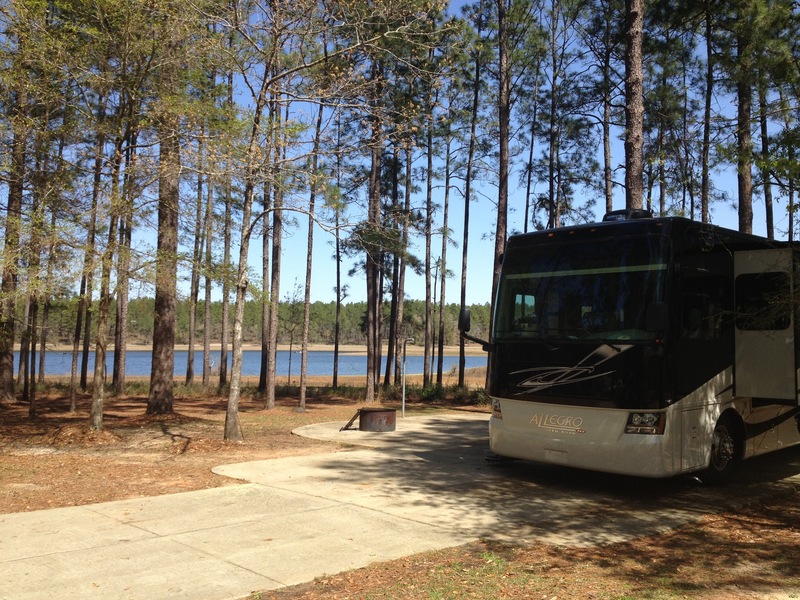 Our first stop was the Conecuh National Forest in south Alabama. The day we left, our departure was delayed by about 4 hours because of all of the last minute things we failed to anticipate, and the fact that we had renters checking into our house the next day and had a lot to do to make sure it was ready. Once were inside the forest, we took one wrong turn and ended up having to back up onto the highway to turn around. So needless to say we were a little frazzled when we finally arrived. We got settled into our campsite and Deas cooked a delicious steak dinner on the grill. We were just finally starting to relax, the doggies were all settled down next to us, and were having a nice quiet glass of wine by the fire. Then, the out of the darkness, two men come walking up to our campsite with flashlights shining in our faces. The dogs went crazy barking, and Deas starts walking towards the men asking who they are. “Stop right there, sir!” yells one of the men. Turns out they were forest rangers. And they were there on a mission. 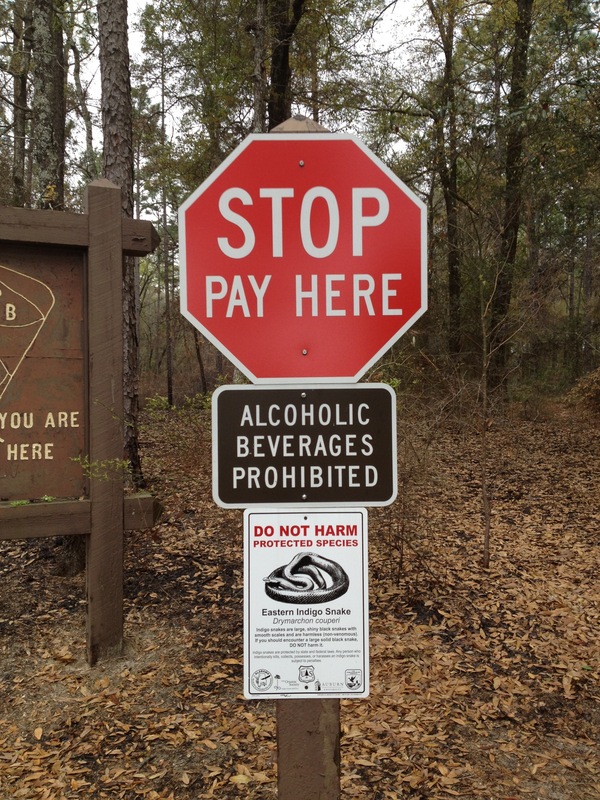 Apparently, as we were about to learn the hard way, you can’t have alcohol in a federal park. And there was a wine bottle right on the table. They were pretty young guys, so I tried turning on the charm and pleading ignorance. I think I may have a had a shot of talking my way out of the ticket, but when Deas heard what the fine was going to be ($125), he about lost it. He starts arguing with the guy and telling him he should go look at all of the other campsites. 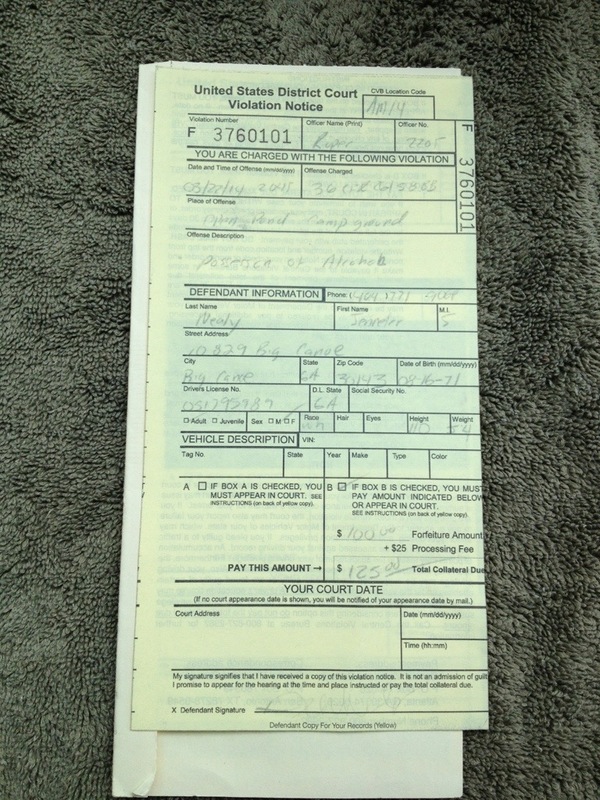 The $125 ticket almost became a $250 ticket! But they were nice enough (ha) to only give me the ticket. So there you have it. I’m now a registered alcohol violator in the federal park system! And I’m out $125. Deas was livid. After the rangers left and we were back in the RV, he was ranting and raving and saying he was going to call our state senator and that he was going to “take on” the federal government. As far as I know he has not made any progress on that front. The offending bottle of wine. It wasn’t even a nice one! At least our campsite was pretty! You guys handled this situation with more grace than I would be able to muster. I would like to do a video about this topic someday. I wouldn’t say Deas was too graceful about it….I must not have adequately described his ranting and raving that night! You should do a video about it – I already got one visitor to my blog from someone who searched on “alcohol in the Conecuh Forest” so I’m sure a lot of people would be interested. Funny enough, we’re in another national forest now, and drinking is okay. I’d love to know what the difference is. Let us know if want us to do a re-enactment!